From the young warrior Strider to the valiant King, every skirmish matters on the adventure to reign supreme!In The Lord of the Rings: Aragorn's Quest, players become the legendary Aragorn as they embark upon a single player quest reliving the hero’s most valiant battles from The Lord of the Rings trilogy. 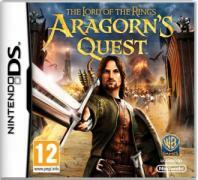 This action combat game allows players to defend Middle-earth against Sauron’s evil forces using their mighty sword. Progressing through the game, upgrades can be made to Aragorn’s weapons, armor and combat skills to fit individual fighting styles.Features: Extension of the Movie Experience: Embark upon a single player campaign that follows the story of Aragorn, spanning The Lord of the Rings trilogy. Intuitive, Pick-Up-and-Play Combat System: Experience skirmishes that are satisfying and fun for the casual gamer, but with customizable upgrades and abilities that appeals to more sophisticated players. Upgradeable Combat: Customize Aragorn to suit your battle style by unlocking abilities and upgrading armor as the character levels up and develops. Unlock Special Character abilities: Unleash powerful moves by gaining morale as players launch attack against enemies. These moves can range from offensive attacks and ranged attacks to temporary boosts during the course of the game. Bonus Arena Mode: Test your combat skill in a series of small battlefields set in key locations of Middle-earth. Players can earn special items by completing a series of goals, and then use those items in story mode.